Whether you're looking to make a substantial vegetarian dish for your Thanksgiving table, or whether you just love making savory tarts any time of year, this recipe is super easy, delicious, and endlessly modifiable. Yes, it uses store bought puff pastry. In terms of pre-made things, puff pastry and phyllo dough are two of things I prefer to buy already made. They're complicated and time consuming pastry to make at home, and there are excellent versions of both at the market. In the picture above I made the tart without egg and creme fraiche/sour cream. The egg and cream will bind the mushrooms a little better, but frankly, I didn't mind it with the mushrooms coming apart a bit. It tasted more mushroomy. If you do use the egg binder, then make sure you're mixture isn't too wet or your tart will get soggy. If you're not a mushroom fan, you can take the same principles for making this tart, and make it with a combination of any other kind of filling: roasted squash and fennel, sautéed zucchini pepper and feta, potato leek... you get the idea. Basically, you want the filling to be mostly or partially cooked, so that you're really just putting the tart in the oven for the pastry's sake. You can check out a video of this recipe on our Thanksgiving Pies series over at The Assembly Line . You can also follow us on Instagram or Facebook for weekly recipes and videos. In a large skillet, add the butter and olive oil. Add the sliced shallots to the butter and oil. Stir and let the shallots heat up for 2 minutes, until just fragrant and slightly softened. Add the mushrooms to the shallots, and cook until the mushrooms are softened and the moisture has evaporated, about 5-6 minutes. Add the garlic and sherry vinegar to the pan and sauté for an additional 1-2 minutes. Season generously with salt and pepper. Transfer the mixture to a bowl, and allow the mushrooms to fully cool. In a small bowl combine the sour cream and egg until the egg is fully incorporated. Add the sour cream mixture to the cooled mushroom mixture in the bowl, stir until fully combined. 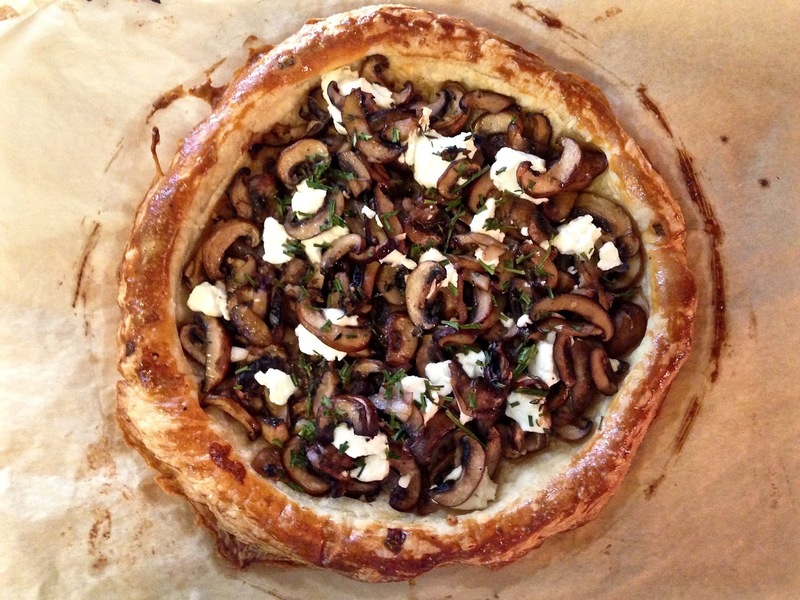 Roll out your puff pastry so that it is larger in size than a large dinner plate. Using the dinner plate upside down as a stencil, cut a circle out of the puff pastry. Using a smaller salad plate, gently score an inner circle inside of the larger puff pastry circle. Using a fork, gently poke the inner circle of the puff pastry. Add the mushroom mixture to the inner circle of pastry. Use a slotted spoon to transfer the mushrooms, any extra liquid can remain in the bowl. Top with goat cheese and thyme. Brush the outer edges of the pastry with egg wash.
Bake for 20-25 minutes, or until the pastry is browned and fully cooked. Once fully cooked, top with fresh chives. Serve warm or at room temperature.